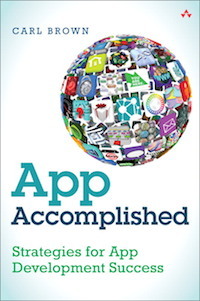 This is the companion blog for App Accomplished: Strategies for App Development Success published by Addison-Wesley Professional July 2014. My name is Carl Brown and I wrote the book to try to raise the quality of mobile app development. In my consulting practice, I often talk to potential clients whose projects have failed (or are failing). It turns out that’s very common. It’s easy for someone to call themselves a mobile developer, and many people do. Unfortunately, being able to write mobile app code doesn’t make a person qualified to successfully build a complete app to spec, especially not on a schedule and with a budget. It’s very difficult for someone, especially someone who doesn’t code, to interview and select a mobile developer. Once a developer has been selected and a project started, it’s also difficult to manage and communicate effectively with the developer. It’s hard for people who don’t code to make sure they get their money’s worth. I wrote the book with the goal of trying to make that process easier. It’s a step-by-step guide to your app project, from figuring out what you want to make, to finding the developer who can make it, to ensuring that it gets made. So many app development projects fail, so much money is wasted and so many potential app creators are left disappointed. This book (and this site) are my attempt to make that better.